In his third State of the Union address to the US Congress, President Donald Trump announced that he would be meeting North Korean leader Kim Jong-un later this month in Vietnam for their second summit. “As part of a bold new diplomacy, we continue our historic push for peace on the Korean peninsula,” he said. There have been many contradictions in the President’s policies towards North Korea. ThePrint tells you how these are likely to emerge as major challenges going forward. It has become amply evident that the final foreign policy aims of both North Korea and the United States do not coincide. 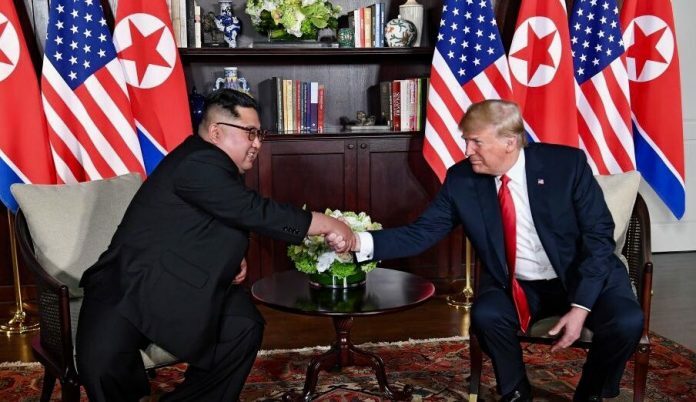 At the first Kim-Trump summit in Singapore last year, America and North Korea agreed to the “complete denuclearization of the Korean Peninsula”. While this is the preferred course for Washington, North Koreans are not even remotely on the same page. Since the Singapore summit, North Korea has continued to enrich its uranium stockpiles and work on its missiles, as suggested by US intelligence reports. More importantly, the North Korean policy continues to remain the same. They insist that they will denuclearise only on the condition that the US follows up with reciprocal denuclearisation. Since the emergence of Kim Jong-un as the leader of North Korea a few years ago, we saw a rapid acceleration in the development of North Korea’s nuclear programme. Beating the expectations of veteran nuclear weapons analysts, North Korea managed to emerge as a nuclear power in 2017. For Kim, a successful nuclear capacity is necessary for his regime’s survival. As long as his country continues to have this capacity, they are unlikely to see serious exertion from the American side. As mentioned before, Trump said it was because of him that there was no war with North Korea. In all fairness, it is more plausible that there is no war because North Korea is a nuclear power. This is perhaps the biggest sticking point in this relationship, and may continue to be so. The US has insisted on the complete denuclearisation of North Korea. Given that this is unlikely, the more appropriate scenario is to develop a mutual-nuclear-deterrence relationship with North Korea. The problem is that this would require the US to go back on its demands of “denuclearisation” and accept North Korea as the newest nuclear state. Given these three factors, it is unlikely that the Trump-Kim Vietnam Summit will be anything more than another photo-op. The Broader Context: Global Nuclear politics is back! The North Korea-US tussle over nuclear power cannot be seen in isolation. There is a clear upward trend in the salience of nuclear politics. Iran and the US remain locked in a dispute centred on Iran’s nuclear programme. On the other side, the collapse of nuclear-weapons-control agreements such as the INF treaty between Russia and America is bringing back nuclear instability. Unlike our expectations a decade ago, it is safe to say, the salience of nuclear power is back at play in global politics.